Perth’s historical Clontarf has just been put into exclusive Aboriginal ownership following a $26 million gift from the Christian Brothers. For the deal to go through the Vatican’s Papacy had to seal it all with their approval, which they gave. Clontarf Aboriginal College stands on land that was owned by the Christian Brothers, but for over a decade the Brothers have been planning to hand over the site to Aboriginal ownership. Clontarf Aboriginal College is governed by a representative Board of Management which is responsible to the Catholic Archbishop of Perth through the Director of Catholic Education of Western Australia. The day to day running of the College, including the hiring of staff and enrollment of students, is the responsibility of the College Principal. After the decade’s worth of negotiations the Perth site was handed to the Indigenous Land Corporation (ILC). 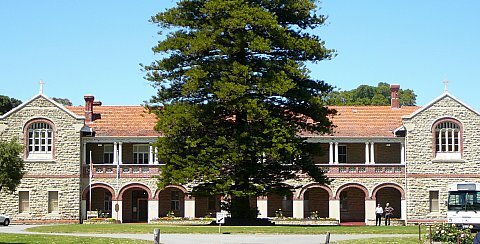 Clontarf was originally a boys’ orphanage opened in 1901 before becoming a school of more than 120 Aboriginal students from years 7 to 12. Dr Casey said the ILC would continue to support the Aboriginal based organisations at Clontarf. Federal Minister for Aboriginal Affairs Jenny Macklin congratulated the College’s exclusive Aboriginal ownership and the Christian Brothers for making it possible. “It is a symbolic and practical demonstration of reconciliation,” said Ms Macklin. Clontarf Aboriginal College is a co-educational Catholic school in the Edmund Rice tradition. The College also boards students, males and females. The Stringer has visited Clontarf on a number of occasions. The College was originally known as St Joseph’s Boys’ Orphanage. It would later be known as Clontarf Boys’ Town and would have a farm on site. The boys worked on the farm and were also engaged in assisting with much of the building work. During World War Two Clontarf was occupied by the Royal Australian Air Force but after the war Clontarf resumed as a boys’ orphanage. In 1961 Clontarf was also extended as a general school and the numbers rose to 300 but the school was closed in 1964. In 1961, the function of Clontarf was extended and it operated as a general school enrolling both day and boarding students. For a few years enrollments rose steadily until 1964 when over 300 students enrolled. Numbers then fell away dramatically and Clontarf was eventually closed as a general school. The Clontarf Aboriginal College was opened in 1986. In January 200, the Clontarf Football Academy was established to provide a high level of coaching for Clontarf College boys. Soon after, a Girls Academy for netball and basketball followed. Clontarf is spread out on a sprawl of more than 12 hectares on the banks of the Canning River, and it includes varied Aboriginal service organisations involved in education, health, arts, sport. The site includes Abmusic Aboriginal Corporation, Marr Mooditj, Dumbartung Aboriginal Corporation and Dumbartung’s haunting Kyana Gallery, the largest collection of Aboriginal history that The Stringer has seen. not begrudging the aboriginals with the site of clontarf but let the people know what it was when it was clontarf boys town,i was there in early fifties .how the so called christian bros treated the young children also the big boys with such inhumane cruelity so you tell miss Macklin she does not know what she”s talking about. Ask the kids that where there what it was like i bet you will get a big surprise .Every govt and organisations tell you its all roses,not bloody true.i am now in my 70s and i dont forget how i repeat how we where treated by the brothers .